Copyright 2010-2019 Hands4Africa Inc. All rights reserved. We support many projects to improve Berega Hospital. 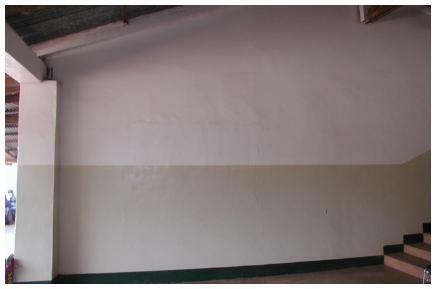 Our latest is educational murals. 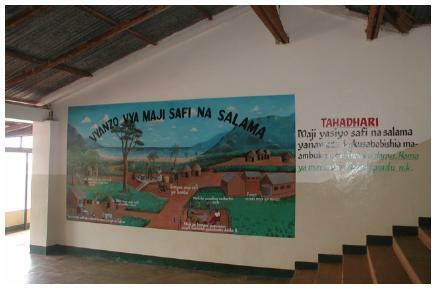 These murals depict village life and strive to educate people about different aspects of health. We recently completed this mural that teaches about the safe use of water. It highlights measures to ensure safe and clean water usage including washing your hands with soap, boiling your water for at least 3 minutes prior to drinking it, and getting fresh water from water wells. It promotes keeping the lid on the bucket to keep the water clean and promotes collection of rain water. On the right side it says: "Beware, if you don't use clean water sources, you may get diarrhea, cholera, typhoid". It also mentions keeping young children away from the fire (this was highlighted by several doctors and nurses, since at the time it was painted we had a patient at the hospital, a young boy, with severe burns to his body from rolling into the fire at night while sleeping).